The New York State Senate approved their version of the MMA Bill yesterday by a vote of 48 to 14, making it the eighth time in seven years they've done so (last year they did it twice, with the extra thumbs-up coming after the MMA Bill was overhauled and revised). 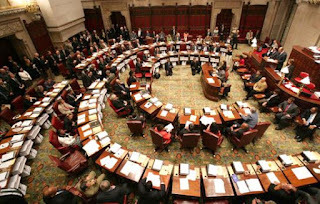 The Republican-run Senate has never been much of a problem for proponents of the sport - the hold-up has traditionally been in the Assembly, which has yet to vote on their version and whose approval is needed to turn both bills into a law. So big deal, right? The Senate just did what it's always done, and there's nothing to be too thrilled about - right? Not quite. Before you dismiss what happened yesterday as something less than noteworthy, consider the timing of the Senate's actions.